Our room was upgraded to junior suite so that was a big plus. The private swimming pool was great and the room was spacious. The location is perfect! Beautiful grounds and it felt very private. I loved the openness of the living and pool area, but also appreciated the ability to close of the bedroom and enjoy the fabulous AC (and keep the bugs out). The pool was clean and well-maintained and the garden bathroom was a fun bonus. Property is located in Seminyak and close to many fine restaurants and favorite ones such as: The Holy Crab and Japs Restaurant Rayjin. Staffs are so helpful in making the stay pleasant. The place overall was nice, clean, and relaxing. The staff was amazing. As for the breakfast issues that I mentioned, the management recognized their mistakes and made amends. For that I would definitely come back again and I highly recommend staying in The Sanyas Suite if you are ever in Bali. The staff were really kind and the free transport with the hotel was convenient. The Staff were friendly and welcoming. With our food issues the management did compensate us $10 off the meal. 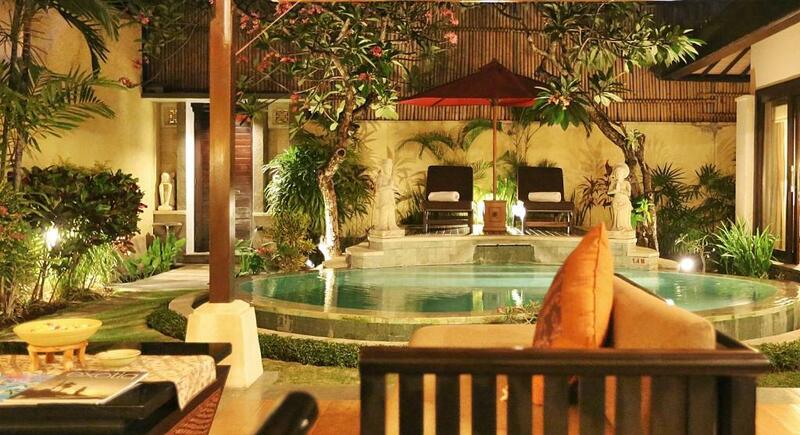 Lock in a great price for The Sanyas Suite Bali – rated 8.9 by recent guests! 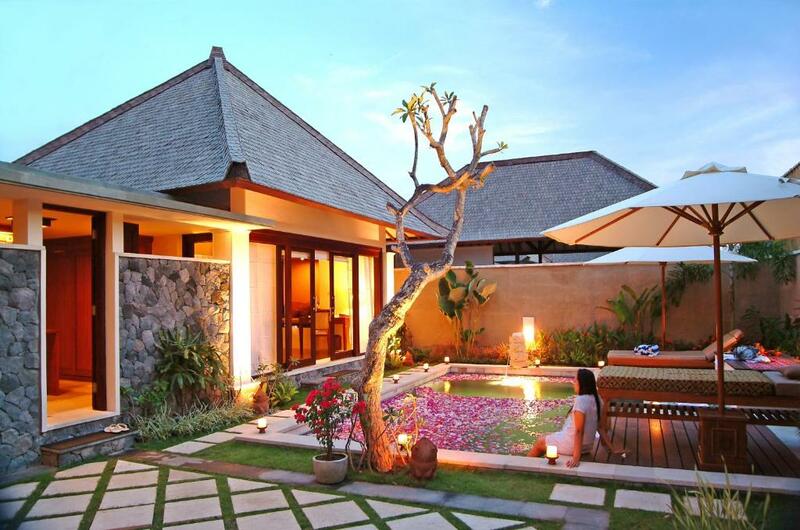 The Sanyas Suite Bali This rating is a reflection of how the property compares to the industry standard when it comes to price, facilities and services available. It's based on a self-evaluation by the property. Use this rating to help choose your stay! One of our top picks in Seminyak.A 5-minute drive from Petitenget Beach, The Sanyas Suite Bali offers accommodations with a private pool. This resort features free WiFi, a restaurant and a well-appointed spa. With a 24-hour front desk, the resort also provides car rental services and free parking. Other services include in-room dining, laundry and dry cleaning. 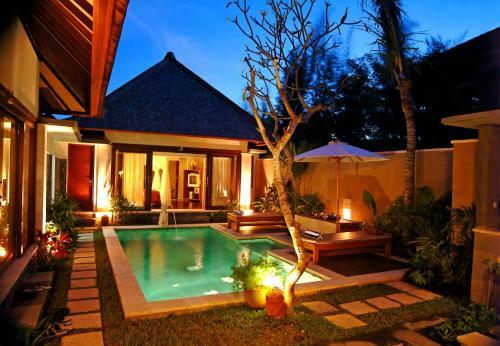 Bali Sanyas Suite is 0.9 mi from Seminyak Beach and 1.9 mi from Legian Beach. Ngurah Rai International Airport is a 20-minute drive from the resort. 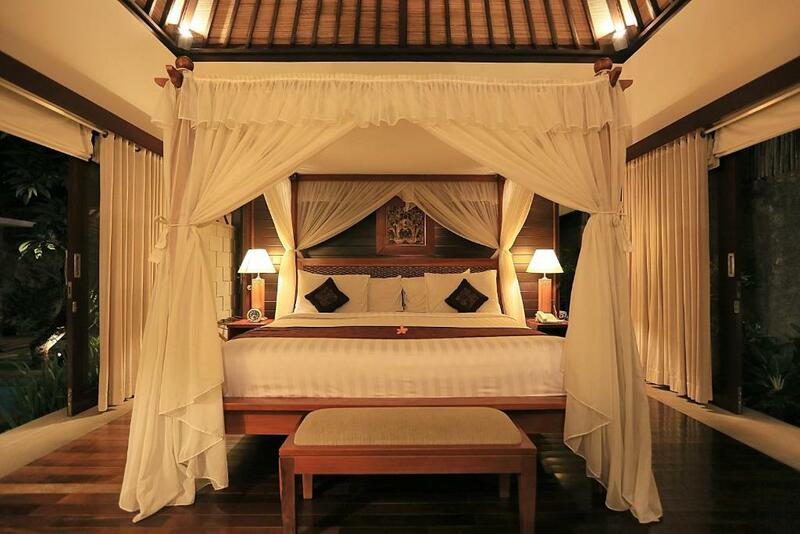 When would you like to stay at The Sanyas Suite Bali? This suite villa comes with a private outdoor pool a kitchenette and dining area. There's also a living area overlooking the pool, The bedoom comes with air conditioning and flat screen TV and an private bathroom. 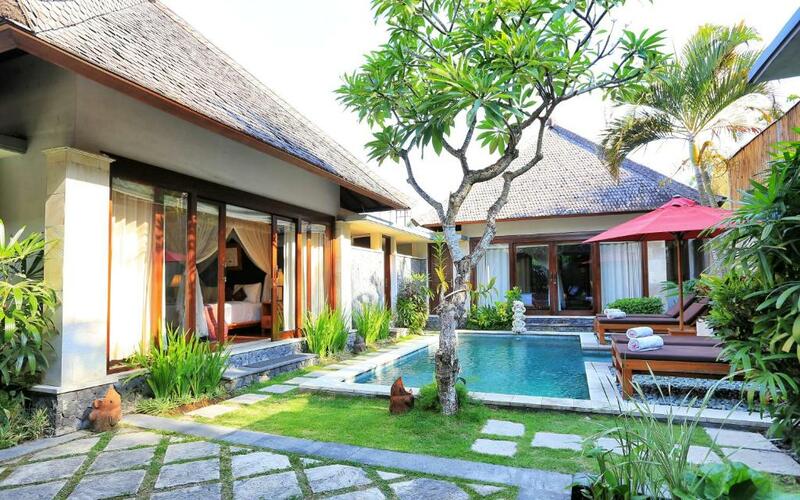 This suite villa features a private outdoor swimming pool, a kitchenette and a separate living area. The bedroom comes with air conditioning and flat screen TV with cable channels and outdoor shower. Accommodating up to 4 people, this suite villa has a private pool, an open plan seating and dining area, a kitchenette and 2 bedrooms. It's fitted with air conditioning, a flat screen TV with cable channels and a semi-outdoor bathroom. The Sanyas Suite is designed with a sanyasin’s philosophy, it is an appropriate place for reaching happiness. In fact, it is designed for relaxation and rest from your daily routines with beautiful architecture and comfortable furnishing. It is where you can find inner tranquility. The Sanyas Suite is present the building with wooden "siraf roofs" & unique entrance gate is inspired by typical of traditional Balinese courtyard houses. The open air living area pavilion includes an informal dining lounge & pantry . 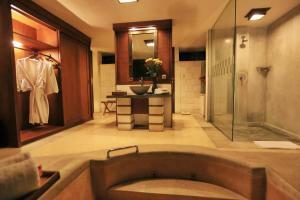 Each villa with private pool, bathrooms with bathtub, Jacuzzi Bathtub , indoor & outdoor shower in natural setting. Feel the fine decorated with Balinese antique. 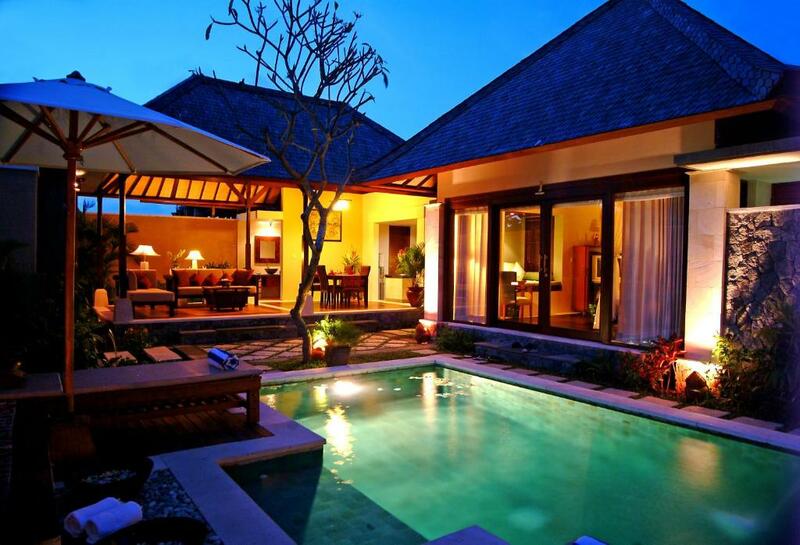 The Sanyas Suite Villa, is located on the hearts of Petitenget street, one of our favorite streets in Bali. Many famous place nearby with the villa which will make your day more fun and enjoyable since Jalan Petitenget is where all the action is. Home to some ace bars, awesome restaurants, and fabulous shopping, this uber long street deserves a good gander, so devote a whole day for all your need and refresh your mind. House Rules The Sanyas Suite Bali takes special requests – add in the next step! The Sanyas Suite Bali accepts these cards and reserves the right to temporarily hold an amount prior to arrival. Please inform The Sanyas Suite Bali of your expected arrival time in advance. You can use the Special Requests box when booking, or contact the property directly using the contact details in your confirmation. From the moment we arrived we felt very welcomed and throughout our stay everyone was so helpful and went above and beyond for us! The choice of breakfast included also had so much variety to pick from. The villa itself was also perfect would definitely reccomend. I have a dust allergy and after the first night and second night even after changing the bed sheet, I still had allergy all over my legs. I had to take allergy medicine for 3days. if you have an allergy or sensitive skin, please do ask for one more blanket and use it as a bedsheet. And there's a lot of mosquitoes. please don't forget to mosquitoes spray all over your body all the times. there's a famous club 'Mirro' behind the villa. you will hear the club music on Thurs ~ Saturday 11 pm to late night. it bothers you but you still can fall asleep. but if you are sensitive, please take note! The last thing, do tell the front desk you don't want to be disturbed by the house cleaning service at 10 am if you are not an early morning person. Because they start pressing the bell at 10 am until you open door for them! Everything was exceptional, especially the service from start to finish! Would definitely be staying again!! Can’t think of a negative. A lot of nagging when it comes to room service and pest control. Great location. The staff were all amazing. Food was not very good. There was a tree next to the pool so the pool tended to be very dirty because of the falling leaves and attached dirt. Internet was very patchy. The place needed some maintenance work and there were gaps in the sliding doors. The toilet needed at good 4 flushes or so to make any waste go down. The location was great with many restaurants and shops at walking distance. Special shout out to Ira, who was an absolute joy at the reception. Breakfast included was good and arrived on time everyday. The bathroom has a very spacious tub. Hot water was scolding hot. taps & plug didnt work well they are getting old and worn out. Bath tub was amazing though. Rooms need an up date looking a bit tired, bed very hard pillows not good a bit uncomfortable. We were also told we would be picked up and dropped off at the airport prior to our arrival. We were picked up but told we would have to get an uber to the airport on departure a bit disappointing, otherwise a nice stay. 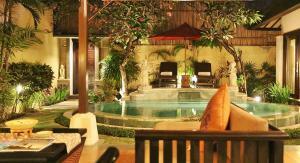 Even though the property was in the heart of Seminyak, the room was quite clean and free of insects. Most of the property is outside but the bedroom is sealed so you can keep it nice and cold with ease. All staff and arrangements were perfect! I am obliged...and overwhelmed... Really Appreciate!! Loved everything....extra points for Ms Ayu Ira!!! She managed a lot things for us right from the beginning till very end! The air conditioner made the room generally comfortable but it would have been nice if it was a little stronger. Also (mostly due to the tropical location) there were a few large spiders and geckos found in the room. The room itself though was very clean so the spiders were no fault of the cleaning services. The breakfast was great. In-room dining was very good and affordable. The staff were amazing and the room was very large with a large pool and great outdoor bathroom. Further, private garden surrounding the pool was very beautiful.